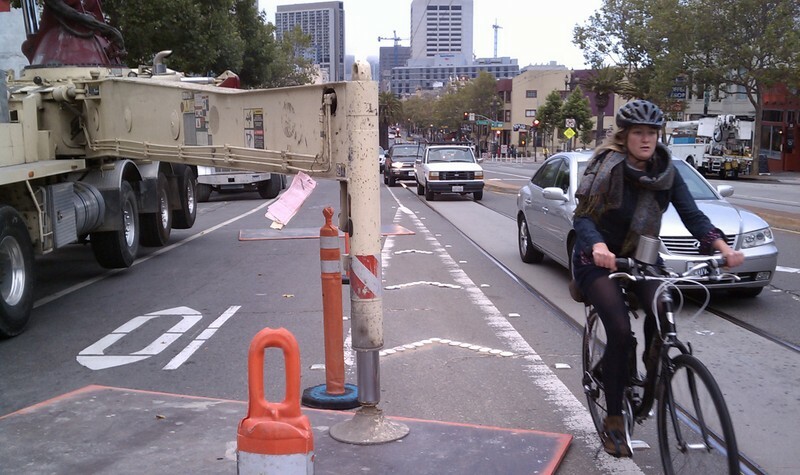 We recently wrote about the benefits to bicycle riders that come from temporarily removing car parking at construction sites. But there are other times when construction can do just the opposite, throwing them into harm’s way. 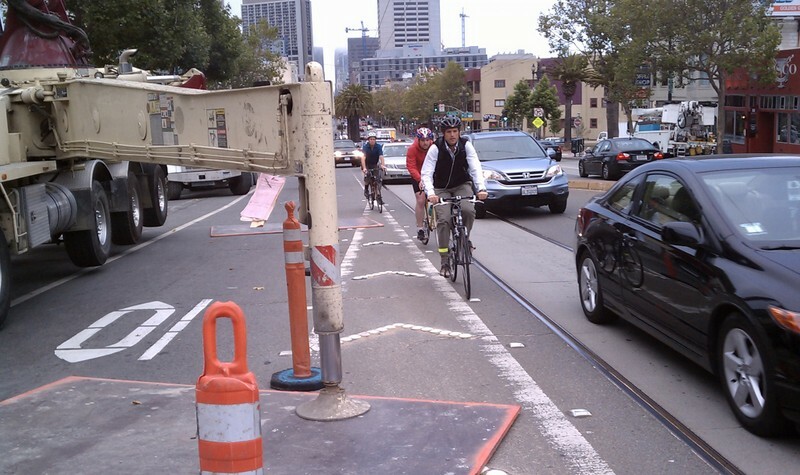 At the very same construction site at 1844 Market Street, where we pointed out that parking removal had improved conditions for bicycle commuters climbing the hill to the Wiggle, crews last Friday set up a dangerous and perplexing labyrinth for evening rush hour bicycle traffic. To make room for what appeared to be a concrete pouring machine, the parking, bicycle, and right-most traffic lanes were closed, leaving no choice but to merge into a lane with car traffic and trolley tracks, or, as most bike commuters chose, to delicately negotiate the extremely narrow space between the trolley tracks and reflective road bumps. Residents of any major city are used to putting up with inconveniences for construction. But in this all-too-common situation, people were thrown into dangerous conditions with virtually no guidance about how to pass safely aside from a sign reading, “Bikes allowed use of full lane” (even if the lane has tracks, that’s apparently all that’s required by law [PDF]). The sidewalk was also closed, with vague signage asking pedestrians to detour to the other side of the street, leading some to walk in the road. While I’m no engineer, the safer solution here didn’t appear obvious. It’s not easy to safely accommodate all modes during construction, but it can be done. A city must send concrete signals that it takes bicycle traffic seriously. 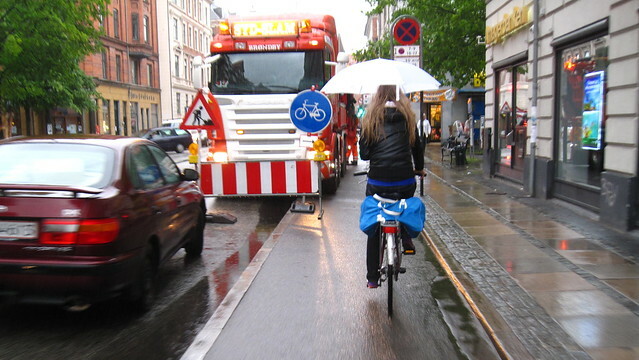 Cycling citizens need a city that is reliable in its maintenance and prioritisation of bicycles. If they can count on their infrastructure being taken care of, it will encourage them to ride. If trains, for example, are unreliable, fewer people will use them and look to other modes. The same applies to bicycle traffic. Rain or snow. Roadworks or smooth sailing. 24-7. If you drive to work in San Francisco, you can expect to face some delays and detours at a construction site, but you will probably never feel that the arrangement actually puts your life in danger. Even during rush hour on Market, the street most heavily traveled by bike, this is one more instance in which the city’s lack of consideration signals to its citizens that the choice to ride a bike will be met with peril. Stockton, closed between Geary and Market, NOT ONE SIGN directing bike traffic where to go. So, guess what, they hop on the sidewalk. FAIL. You know all this blocking of sidewalks and bike lanes without providing safe substitutes is in blatant violation of city policy, right? http://www.sfmta.com/cms/vcons/documents/BlueBook7thEd-OnlineVers2008-0701.pdf The contractor is subject to a $5000 fine for violations. I forgot to mention that there was a “bikes allowed use of full lane” sign (just added it in there). It seems that’s actually compliant with the regulations, as far as I can tell. Full use of the lane with tracks running down it? The Healdsburg bridge will be closed for 18-24 months. There are only 2 bridges over the Russian River anywhere near Healdsburg – this bridge and the one on US-101. Or you can take a 20ish mile detour over the Wohler Bridge. The article does say they are trying to figure out what to do. It does not include the idea of allowing bikes on US-101, which would work but I’d be less than thrilled at this option, especially with a bike trailer, given that since motorists will be coming off the exit into Healdsburg in higher frequencies since they will be taking the same detour. But there are a *lot* of cyclists and pedestrians who use this bridge. A shuttle? What will that do for group rides of 50+ that frequently use that route? For large families coming from town to the Memorial Beach? I think they have to have the a shuttle/open the railroad bridge somehow *and* allow travel on US-101. Note that the Crystal Springs Dam (Skyline Blvd) is closed above San Mateo – motorists can get around by using 280 but this is still prohibited for bikes who must go down Crystal Springs Road to Polhemous and back up to Skyline (Canada Road). And now this week Crystal Springs is closed so cyclists must take a detour through a neighborhood – if they even know how to do so. Unlike the Healdsburg situation most cyclists using the road around the dam are going to be pretty fit. Both the Dam and the Bridge need repair, but they need to make good accommodations. If bikes are allowed full use of the lane, and assuming this is not a very long stretch or high speed road,I don’t necessarily see the problem. If a cyclist keeps “out of the way” to the right instead of taking the space needed to operate safely, that is their choice. It is great to have so many dedicated facilities to create a more comfortable environment, but at some point, we need to be able to interact with traffic and remember we are a part of it. My favorite is when they put the “construction ahead” signs in the bike lane, forcing you into the travel lane long before the actual construction. I think the one on westbound CC just east of 101 is still there. It’s been there for months. @azb324:disqus what scares me about your photo is that to use the full lane cyclists have to cross over a set of train tracks. I’ve been the victim of a run-in with them before and I always make sure to cross them perpendicularly now. It doesn’t seem like there’s a good way to do that from your photo. The outreach must be made with the Construction Management profession, especially at the graduate school level. Are there any detour signs for cars? If yes, could bikes use those signs too? If no, then that’s an obvious problem for all roadway users. Just wondering though…. do you think that the bikes are on the sidewalks because of the absence of signs, or because they don’t want to detour to adjacent streets? Aaron: thanks for putting out this article. This is one of the things that really irritates (and endangers!) me constantly. It is an utter shame that bicycles are completely ignored when it comes to construction. Just goes to show how amazingly prominent the bias in society is against bicycles. And as @mikesonn:disqus said, the one that drives me nuts is the huge electronic sign smack in the bike lane on westbound Cesar Chavez right before the 101 hairball. Is there somebody we can call about it? I’ve mentioned it to SFBC and I know for sure @twitter-14678929:disqus has as well. Don’t worry, Stanley Roberts is ON IT! based on the picture at top I see a perfectly fine place to cycle for the duration of the construction work. If the entire lane can be used then use merge into it. Go over the tram tracks and ride. That’s how it is done all over Europe… I have to cross tram tracks on several occoasions here in Budapest Hungary. It’s no big deal. Ever been to Amsterdam?Also, based on the picture there seems to be plenty of space between the reflective bumps and the tram tracks, just ride there. I know a dedicated bike lane should be kept open but sometimes that just cannot happen. Wow, that’s a crappy law. Hmmmm, almost sounds like it was written by people who have never ridden a bike in the city …. The problem is that you can’t take the whole lane with the tracks there meaning cars will buzz you and push you towards the construction equipment. I understand the need for the large metal plates under the support arms, but it seems to me like they just tossed them down wherever and could have easily moved them closer to the vehicle to provide more space for cyclists. Way to completely miss who is behaving badly, Stanley. That site on 9th street seems so unnecessary. There are plent of lanes on one-way 9th– they should just keep cars out of the rightmost lane and let us walk there (not to mention that the construction site doesn’t seem to be using the sidewalk for anything but signs and storage). It really is asking a lot of people to close a whole sidewalk like that. I’m not sure what it was like before, but in there right now and the right lane is blocked off for pedestrians to use. example to work with ?